← NBC #1 Broadcast Network Sunday. ‘Sunday Night Football’ Top Broadcast Program. TBS #1 Cable Network. ‘MLB ALCS’ Top Cable Program. ESPN #1 Cable Network. ‘MNF’ Top Cable Program. NBC #1 Broadcast Network Monday. ‘The Voice’ Top Program. Singing and Football dominated viewing on television on Monday. The Daily Diary Of Screens #dailydiaryofscreens 🇺🇸🇬🇧🇦🇺💻📱📺🎬﻿🌎﻿. For Monday, October 15, 2018. This is your U.S. Daily Television Ratings Platform. In the U.S., NBC #1 broadcast network Monday in prime time as The Voice‘ was #1 broadcast program with an average 18.254 million viewers. In the U.S., ESPN #1 cable network Monday in prime time as ‘Monday Night Football‘ featuring the San Francisco 49ers and the Green Bay Packers was #1 cable program with an average 11.881 million viewers. 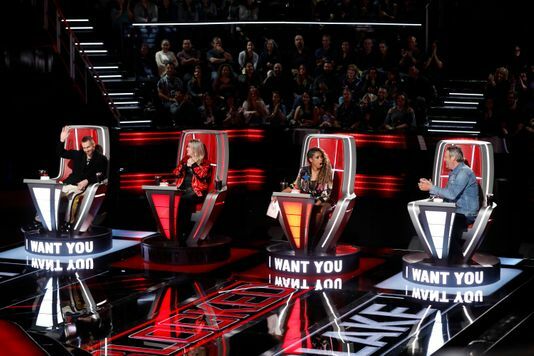 8P ‘The Voice’ finished #1 broadcast program Monday 101518 in prime time with an average 9.875 million viewers. 9P ‘The Voice‘ finished with an average 9.822 million viewers. 10P ‘The Manifest‘ finished with an average 7.532 million viewers. 8P ‘The Neighborhood’ finished with an average 6.406 million viewers. 830P ‘Happy Together’ finished with an average 4.762 million viewers. 9P ‘Magnum P.I.’ finished with an average 5.419 million viewers. 10P ‘Bull’ finished with an average 6.338 million viewers. 8P ‘Dancing With The Stars’ finished with an average 7.331 million viewers. 9P ‘Dancing With The Stars’ finished with an average 6.915 million viewers. 10P ‘The Good Doctor’ finished with an average 6.970 million viewers. 8P ‘The Resident’ finished with an average 4.792 million viewers. 9P ‘9-1-1’ finished with an average 6.162 million viewers. 8P ‘Arrow’ finished with an average 1.325 million viewers. 9P ‘Constantine:The Legend Continues’ finished with an average 611,000 viewers. 8P ‘Monday Night Football’ featuring the Green Bay Packers defeating the San Francisco 49ers finished as the top cable program Monday 101518 with an average 11.881 million viewers. ESPN finished #1 cable network Monday 101518 in prime time with an average 11.283 million viewers. NBC finished #1 broadcast network Monday 101518 in prime time with an average 9.076 million viewers, UP + 7.3% vs SD 2017. ABC finished with an average 7.072 million viewers, DOWN -30.3% vs SD 2017. CBS finished with an average 5.780 million viewers, DOWN -11.9% vs SD 2017. FOX finished with an average 5.477 million viewers, UP 65.0% vs SD 2017. FS1 finished with an average 4.207 million viewers. FNC finished with an average 2.931 million viewers. USA finished with an average 2.396 million viewers. MSNBC finished with an average 1.783 million viewers. The CW finished with an average 968,000 viewers, DOWN -27.2% vs SD 2017. CNN finished with an average 848,000 viewers. Broadcast network viewership Monday in prime time finished with 28.373 million viewers, DOWN -1.501 million viewers (-5.0%) vs 29.874 million viewers SD 2017. This entry was posted in #dailydiaryofscreens., Audience Analysis, Audience Behavior, Audience Management, Broadcast TV Ratings in US, Cable TV Ratings, Cinema, Daily TV Cable Ratings, Data, Digital, Direct, Late Night TV Ratings, Marketing Notes, Media, Media Analysis, Media Management, Mobile, Monday Night TV Ratings, Social Media Note, Television Ratings, Uncategorized and tagged 'MNF' #1 cable program Monday 101518, 'The Voice' #1 broadcast program Monday 101518, Broadcast networks DOWN -5.0% Monday 101518 in prime time vs SD 2017, CNA|SOPHIS, ESPN #1 cable network Monday 101518, Green Bay Packers TV Ratings Monday 101518, Lance Hanish, NBC #1 broadcast network Monday 101518, NBC & FOX only broadcast networks UP Monday 101518 vs SD 2017, San Francisco 49ers TV Ratings Monday 101518. Bookmark the permalink.